Byron and Maggie with their fuel cell and electrolizer. Phil arrived today and Sheryl introduced the other participants to him. Brandie administered the HyTech Pre-assessment. Ken shared an exercise in thinking out-of-the-box. First hour talking about Minute Papers from the previous day. Our topics included Thursday project ideas, the limits of mathematics education, and clarification on the design process. We moved to Science D 9 and Ellen introduced participants to Jim and Andrea. 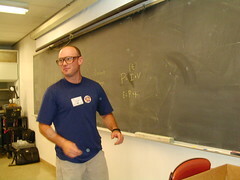 Later James joined to help teach as well. Jim presented overview of HyTech Curriculum along with ideas of how to purchase more KOH solution. He showed a short “teaser” video. 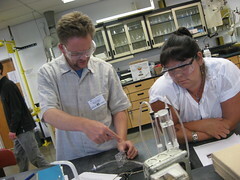 Andrea Allen introduced Activity 2, which was learning how to set up the electrolizer. 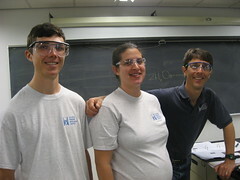 Participants made hydrogen and oxygen. The participants ignited the hydrogen and oxygen! The hydrogen made a nice pop. The oxygen was harder to ignite. Participants asked for bigger test tubes for the oxygen. People discussed using longer matches vs longer sticks. Erin calculates the efficiency and drops a factor of 10. Jim finds a zero on the floor... Errin must have dropped it! 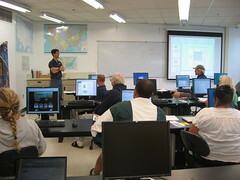 After the afternoon break participants moved to Science D computer lab and learned fuel cell electro chemistry in Activity 4. They reviewed the Lewis Dot diagram for H2O, balanced the related chemical equations, viewed online simulations (1) (2), used the physical model included in the HyTEC curriculum and touched actual pieces of PEM fuel cell. 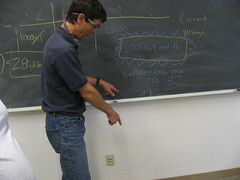 Jim teaching electro chemistry in Science D computer lab. How does the curriculum fit in middle and high school CA science standards? Folks discussed the use of the standards as well as the STAR CST Blueprints. Folks also discussed that the time after STAR testing is a time when interesting and useful activities that are not directly related to the standards can be presented. How to make renewable important to students in Hoopa? Some have asked why burn something you can run out of, which will also help you make plastic heart valves? Look up NEED for curriculum. Lots of free classroom equipment and grants. Learning by doing rather than reading. 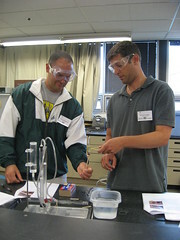 Vince and Brooks ignite hydrogen generated by their electrolizer. How to modify to fit in 7th grade standards and topics of pre-algebra and life science? How to demonstrate how fossil fuels are bad for the environment. How far are Schatz folks willing to travel? What is more efficient – combustion or hydrogen fuel cell car? In a large scale fuel cell, where does the water go? Both presenters clear and straight forward. Tremendous amount of thoughtful curriculum and materials (2) – “like Christmas for a science teacher”!